Getting mehendi or henna designs on the palm is deep-rooted in the Indian custom, particularly up north. Women sport such gorgeous, intricate patterns on their hands and feet during festivals and most importantly at weddings. For the bride, getting a dark stain on her mehendi design is very critical as according to folklore, it is a mark of her husband’s deep love for her. 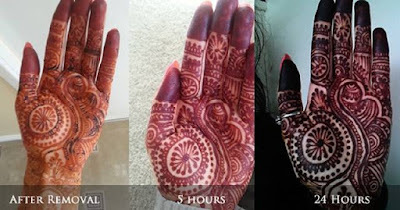 There are expert mehendi artists who have made a career out of this, and cost dear when you hire them for wedding ceremonies such as Mehendi and Sangeet. While a lot of times we just sport henna designs simply as a mark of fashion, we do not end up getting the desired results. The time and money we spend on getting these designs don’t pay off when the stain next morning is nowhere near scarlet, and is a mild orange. Don’t let your efforts at getting mehendi on your hands go waste, we suggest ideas to get a dark red stain every time you apply it. There are some very easy hacks you can easily adapt at home. 1. To ensure that the mehendi is absorbed well by the skin, you need to soap your hands and feet to remove excess oil, dirt and grime. A well absorbed design will give out a darker stain. 2. 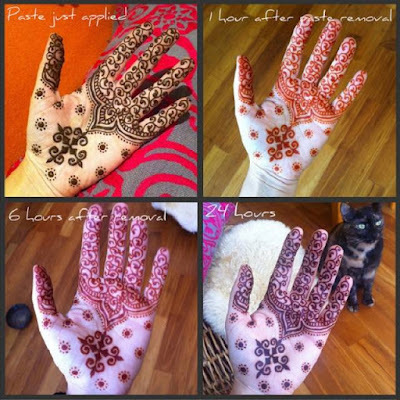 Often times we find uneven colouring on the henna, this is because of the breaks in application. You end up getting up many times for a clean cloth, water etc. Make sure when you sit down to wear mehendi you have all things you need in one place. 3. It is advised to not sit under direct sunlight while applying henna as it damages the colour pigments. Also don’t force the design to dry by sitting under a fan, let drying take its natural course. 4. If you intend to get a waxing done, do it at least 3-4 days before the application of mehendi. Also do not go for waxing the next day of applying henna as you may lose the upper layer of your skin and your design will become lighter. Allow the mehendi to stand for at least 8 hours. In fact if you can keep it until 12 hours, even better. But make sure you do not wash your hands under a running tap. 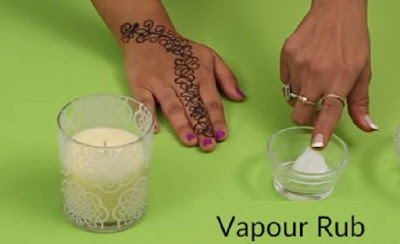 The henna needs to be scraped off using a spoon or simply your fingertips. The colour doesn’t come up immediately on removing, give it a couple of hours. Take half a bowl of water, add a tablespoon sugar to it and bring it to boil. Once the mix cools down, add a few drops of fresh lemon juice to it and blend it thoroughly. When your henna dries up, using a cotton swab dab the mix on it. Do it about 2-3 times. Lemon juice acts as a catalyst for the release of a dark colour, and sugar facilitates better absorption of the colour by keeping the mehendi in contact with the skin. Wrapping the design in a plastic sheet is a good way to keep the design intact, and by not allowing it contact with light and air, the colour can come out darker. Once you have applied the lemon and sugar mix, heat a couple of cloves in a tawa, and in the steam coming out of it warm your hands. This is believed to give a dark stain to your mehendi. 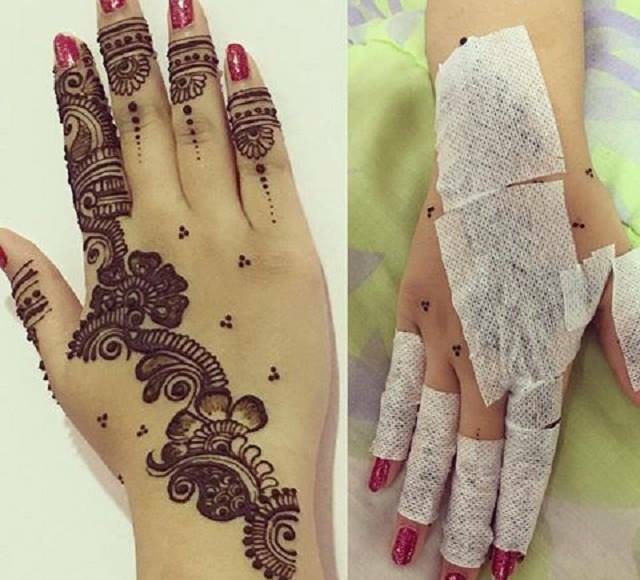 If you are pressed for time, you can remove the henna after this by gently scraping it off. After scraping off the henna, rub some Vicks Vaporub over it. The balm helps intensify the colour, and hence after a few hours the colour you get is extremely impressive.